A great, chocolate and mint Rooibos tea that is perfect for "after dinner"
Summary : An excellent rooibos tea that combines chocolate and mint in just the right proportions, making for a delicious after-dinner tea. Review : Is there anything better than cocoa (also known as chocolate!) and mint? I mean, chocolate and mint is just such a appealing combination. Whether it be in ice cream, after dinner mints or other various creations, chocolate and mint is just "meant" to go together. And so it was with a more than idle curiosity that I decided to sample a Rooibos Coco & Mint Tea (also known as Rooibos Cocomint), put out by Adagio Teas . 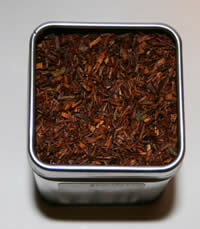 A Rooibos tea, for those not familiar with it, is a red tea. The leaves of the tea are red, not green like what is commonly found in most other teas. Additionally, Rooibos tea comes exclusively from South Africa - making it quite a bit different in geographical terms from most other tea leaves that come from various parts of Asia. And lastly, Rooibos tea has no tannins or caffeine, in the event that you might be bothered by that. Now, this particular tea I sampled is a flavored Rooibos Tea - having mint and cocoa added to it. And my, is it flavored! Just opening up the well packed sample tin I bought from Adagio Teas unleashes quite a strong cocoa/chocolate and mint aroma. So, can we say I was very much looking forward to this tea? And happily, my taste buds were not disappointed. This tea tastes very much like a combination of mint and chocolate. The taste isn't horribly strong, but it is quite distinct. In some ways, this tea reminded me of a weaker cousin of those after dinner candy that contains chocolate and mint. The tea, like these after dinner candy pieces, is quite soothing on the stomach. Because of this, I think this tea would make a great "after dinner" tea - especially if you eat some heavy food like Mexican frequently is. Like other Rooibos teas, the leaves in this Cocomint tea are significantly smaller than what is typically found in many green and white teas. Because of this, don't be too surprised when you make it if leaves end up finding a way out of your infuser and into the bottom of your tea cup or tea pot. Overall, anyone who likes chocolate or mint - and particular the combination of chocolate and mint - should pretty much drop everything and run over to the Adagio Teas website to get this tea. While people who only enjoy the taste of more "traditional teas" may not like this Rooibos Cocomint, I suspect anyone who has a chocolate or candy sweet tooth will find this tea immensely enjoyable - maybe, shall we say...irrestible. Recommendation : This is a chocolate and mint lovers delight - and absolutely the best tea one can find for an "after dinner tea" following a heavy meal. Brewing Instructions : Use 1 tsp of leaves. Heat water to boiling. Pour over leaves. Let tea brew for 6 minutes.